In this month’s asset release, we have uploaded 40 new hub and spoke graphics for you to edit and bend to your will. 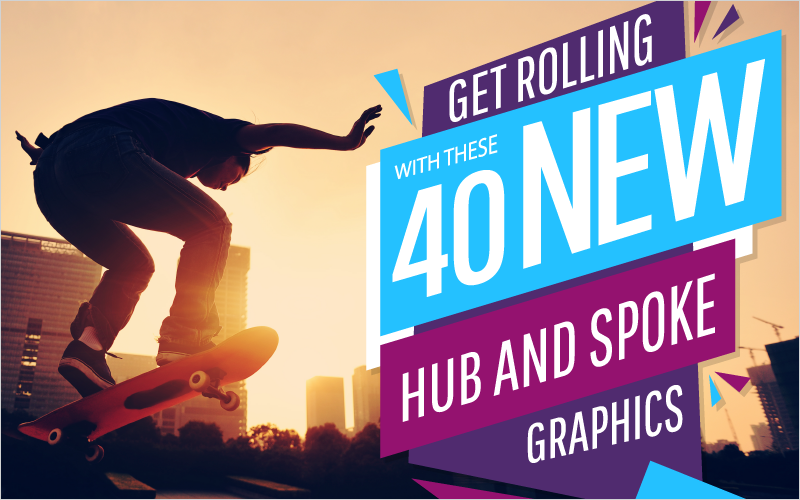 These hub and spoke graphics are built to be simple and easy to customize. These graphics are built for those who want colors, designs, and formats that can fit into almost every professional business presentation. The graphics come pre-built with any different number of spokes numbering from 10 to 3. I will be going through and showing you how easy it is to edit this graphic to fit your needs. So one thing right off the bat that I want to change is the color scheme of the graphic. I want to change the gradients to solid colors and change the mint green to a darker blue. In order to do that you must first ungroup the whole graphic. This will allow you to change the colors of specific objects within the graphic. To ungroup an object Right Click on it and scroll down to Group and click Ungroup. Now you will be able to edit certain and specific parts of the graphic. 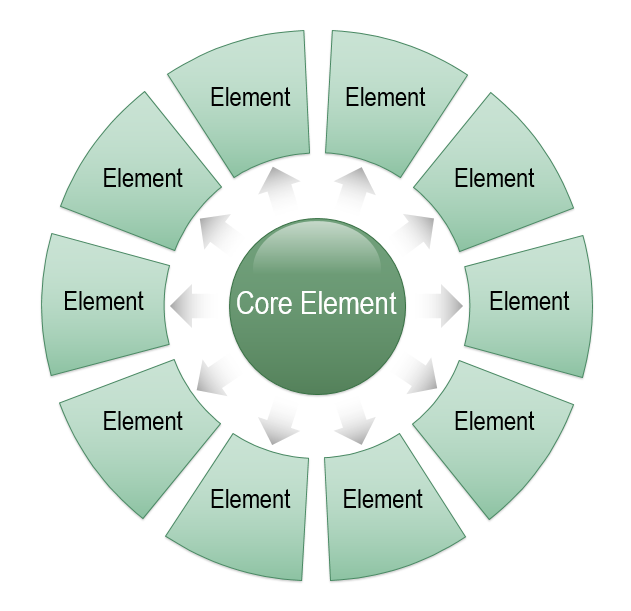 Next, select all of the Element boxes and change the color by right clicking on it and selecting Format Object. From here you can change everything as it pertains to the look and feel of the objects you have selected. Next, I want to add animations to each object to turn this graphic into an animated masterpiece. To add animations to graphics click on an object and go to the Animations tab towards the middle of the main ribbon. 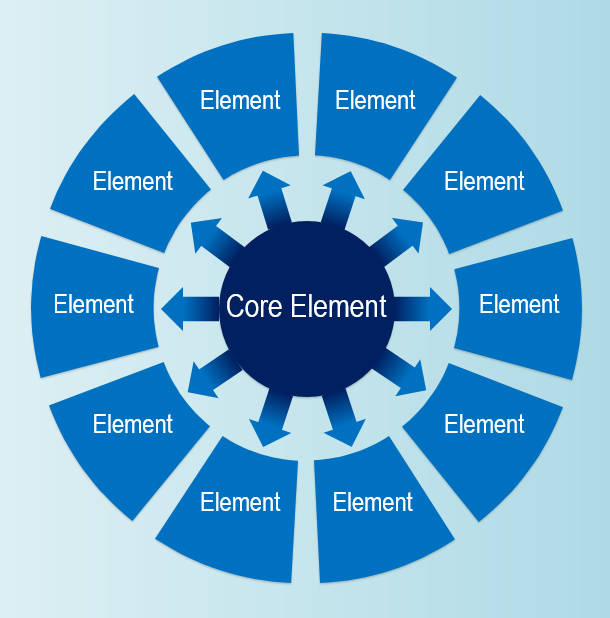 What I want to have happen is once an Element box is clicked, have the box move outwards and have the arrow (that is in between the Element and the Core Element) follow it out. And after that the text will fade into view. I will not be going into depth on how to do it, but here are two blogs (Basic and In Depth) that go in depth on how to use animations in PowerPoint. As you see, the simplicity of these graphics allow you to turn them into a graphic that is 100% suitable for you and your projects. Whether it to brand, animate, or captivate, these graphics are built for it. Click here to get a free trial and try out these simply amazing graphics. Stay tuned for monthly uploads to our ever-growing library!